• Strong, Durable 3/4" Polished Extra-Thick Steel Tubing • Extra-Strong 600D Polyester Fabric for Years of Use • Large Seat Size (14"W x 14"D X 14"L) • Convenient Shoulder Carry Strap • Weight Capacity: 275 lbs. • Expanded Size: 20"H x 14"W x 14"D • Folded Size: 23"H x 3"W x 3"D • 1-YEAR LIMITED WARRANTY • Total Weight: 1 lb. 12 oz. 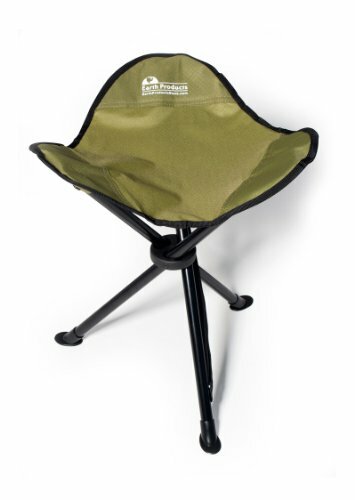 Take the Earth "Easy-Seat" Camp Stool along on any trip! Small, Versatile and Compact, this Outdoor Stool provides Enough Support for HOURS of COMFORTABLE SITTING, ANYWHERE! The "Easy-Seat Stool is one strong, tough outdoor stool. Believe it - built so rugged you can even stand on it!. The expanded size can actually hold up to 275+ lbs. This is a great stool to use for any outdoor activity. Use it anywhere... camping, concerts, at the beach... bring it to any sports event... take it fishing... even use it for your back yard or by the pool! Built with extra strong steel legs and long-lasting nylon fabric, this stool will provide a lifetime of use and comfort! Take it anywhere - small, compact, easy to carry, great to have when you really need it. Be the one with the very compact comfortable seat!